Starting this Friday, family of missing soldier will lead weekly protests near Gaza border, as Arab riots continue. 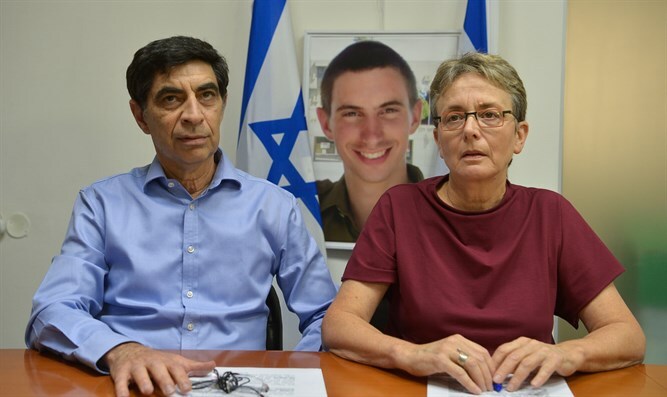 The family of IDF officer Hadar Goldin, whose body is being held by Hamas in the Gaza Strip, will hold weekly protests every week starting this Friday, with the participation of public figures, senior defense establishment officials, and artists. On Friday, May 4, the first event will take place, to be attended by the parents of Hadar Goldin, Leah and Simcha Goldin, former defense minister and co-chairman of the Lobby for the Return of the Soldiers MK Amir Peretz, former head of the Eshkol Council MK Haim Yellin and the singer Elchai Refuah, who was Hadar's commander during Operation Protective Edge and recently renewed the song "The Silver Platter," set to the words of Israeli poet Natan Alterman’s poem about those who sacrificed themselves for the founding of the State of Israel. The protest events will take place every Friday at 2:30 pm at the “Black Arrow” monument near the Gaza Strip.